Creamy Broccoli and Cucumber Salad – this creamy, crunchy salad is so full of flavor and a great addition to the lunchbox, a picnic or a barbeque for Labor Day weekend or anytime. 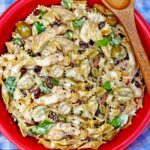 I’ve shared many of my family’s favorite summer salads including my Bacon Arugula Tomato and White Bean Pasta Salad, Two Bean Salad with Garlic Lemon Vinaigrette, Creamy Chicken Pasta Salad with Green Olives and Raisins and most recently my Caprese Pasta Salad. Today, I have another favorite, this delicious Creamy Broccoli and Cucumber Salad. 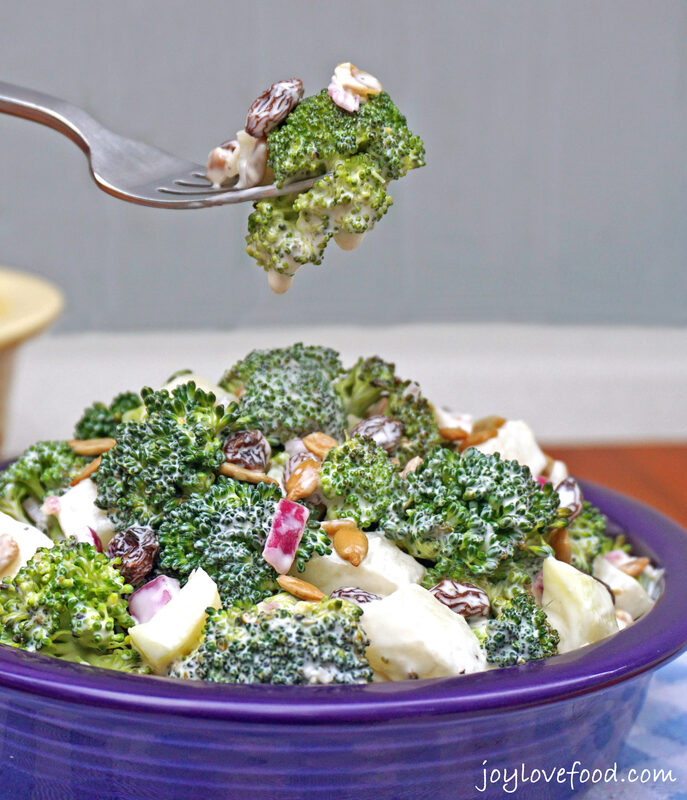 Crunchy broccoli and cucumbers along with some red onions are tossed in a creamy dressing, garlic gives it a nice kick and honey adds a touch of sweetness; raisins and sunflower seeds provide additional sweetness and crunch. 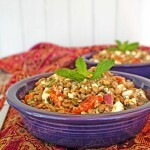 Altogether, this salad is so delicious and full of flavor. 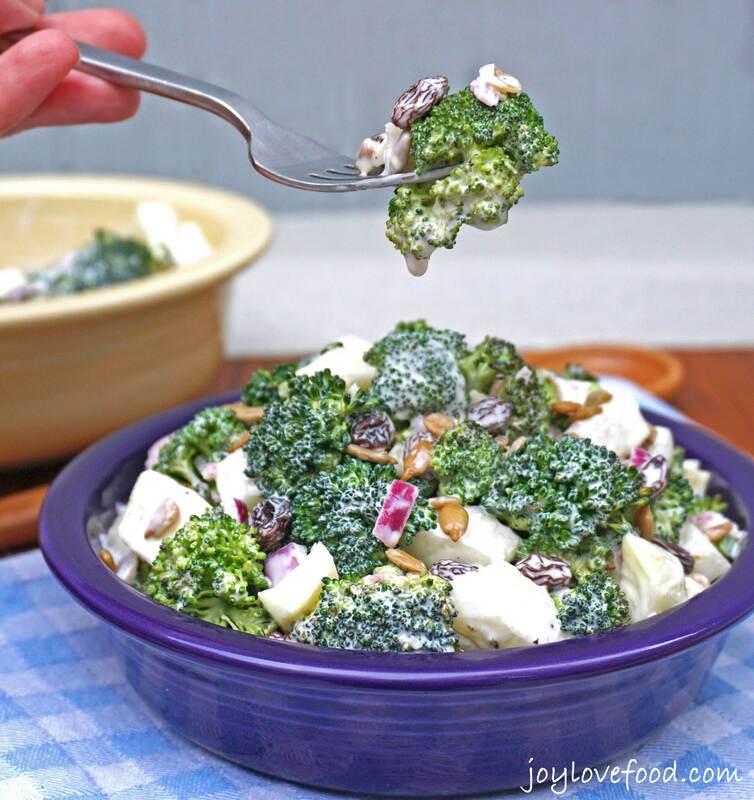 Even people who are not fans of broccoli, raw or otherwise, love this salad, it is that good. This Creamy Broccoli and Cucumber Salad is so versatile and I’ve made many variations of it over the years, depending on what I have in the refrigerator. I’ve made this salad with half broccoli and half cauliflower, I’ve left out the sunflower seeds and/or raisins, I’ve used celery instead of cucumber and green onions instead of red onion — all versions are delicious. In South Hero, VT, one of the Champlain Islands where we have our lake house, there is a wonderful vineyard called Snow Farm Vineyard & Winery. During the summer the vineyard has a concert series, each Thursday evening they have a different band and they open up the grounds to the public for picnicking. The concerts are a lot of fun for both kids and adults and are very popular, and people bring the most elaborate picnics. This Creamy Broccoli and Cucumber Salad is a regular at our concert picnics and is always a big hit with whichever guests we have staying with us at the time. This delicious Creamy Broccoli and Cucumber Salad is a wonderful dish for picnics or in the lunchbox. This creamy, crunchy salad is also a great accompaniment to all sorts of grilled entrees and is the perfect addition to your next barbeque this Labor Day weekend or anytime. Does your family have a favorite broccoli salad recipe? Let me know in the comments below! Creamy Broccoli and Cucumber Salad - this creamy, crunchy salad is so full of flavor and a great addition to the lunchbox, a picnic or a barbeque for Labor Day weekend or anytime. 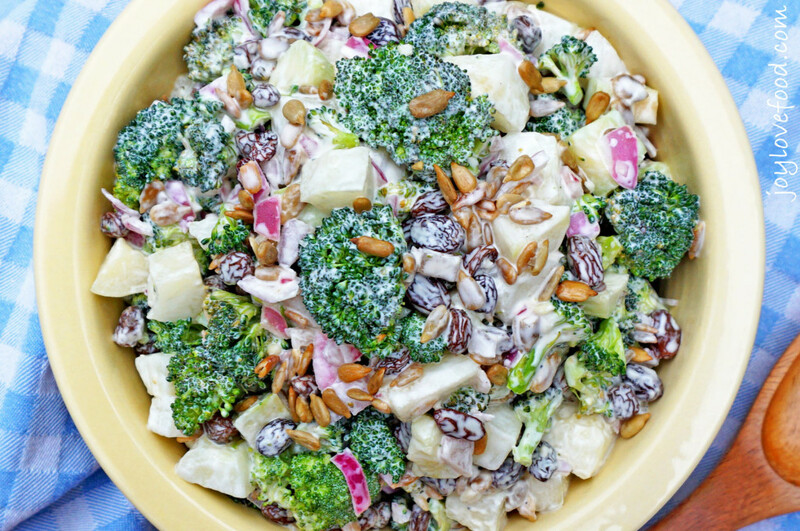 Add broccoli, cucumber, red onion, raisins and sunflower seeds to a large bowl. In a small bowl, whisk together mayonnaise, white wine vinegar, garlic, honey and 1 teaspoon salt to make a dressing. Pour dressing over broccoli and cucumber mixture, toss to combine. Refrigerate salad for at least 4 hours before serving. 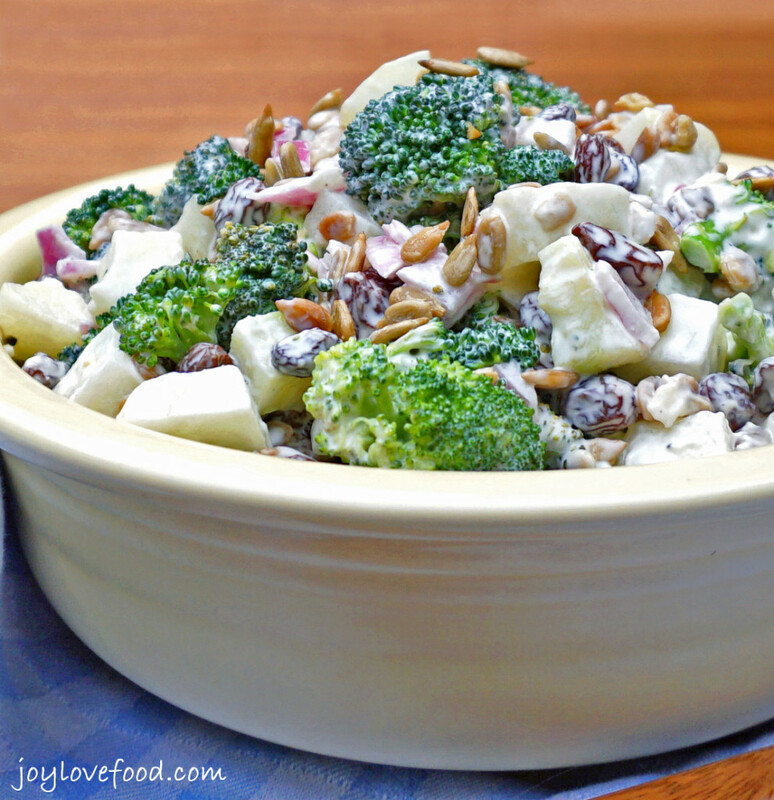 This entry was posted in Main Dishes, Salads & Sides, Vegetarian and tagged broccoli, creamy, cucumber, raisins, recipe, salad, side, sunflower seeds, vegetarian. What a delicious looking broccoli salad! I bet my kids would love this. This looks so good! I love broccoli so I’m sure I’d love it! Another great recipe!! Thanks for sharing on My 2 Favorite Things on Thursday…hope to see you again this week!! Pinned! Elaine recently posted…Rainbow Themed 1st Birthday Party! I love that this can pair perfectly w anything or be a light meal on its own! Yum! One of the best salads I’ve seen in a long time. I’m getting the ingredients this weekend. Thanks 🙂 Pinned! All the textures and flavors of your salad is making me hungry…and I just had breakfast. This one is on my “to do” list for sure. I love creamy broccoli salad, but never thought to add cucumber! Great recipe. I love this salad and the addition of cucumber makes it even more attractive! Love that you added cucumbers to this salad! I could eat a whole bowl to myself. Great recipe! I was looking for this salad today! What do you think about substituting apples for the cucumber? Or, adding them into the mix? I’m trying to figure out if this can work for Rosh Hashanah! 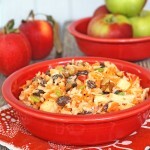 Hi Betsy, apples would be a wonderful substitute or addition, hope you give it a try and enjoy! This is one of my favorite!!! This salad reminds me of a rather expensive salad mix that can be bought at Costco. I know it has been a favorite at many church potlucks. 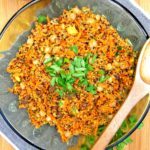 I’ll have to share this recipe with those who often bring it, so that they can make it fresh and delicious like you do. Interesting combo with the broccoli and cucumbers. My kids love broccoli and I think the addition of cucumbers will be a nice change from just plain broccoli salad. My aunt used to make a salad very similar to this that I loved. Her’s had cauliflower in it, but I am actually more of a cucumber fan, so I think that I’d like this recipe better! Oh that looks so good. I could make a whole dinner out of that. Love crunchy salads and all of the variations you suggested, pinned! I love a salad w/ a good crunch; between the broccoli and the sunflower seeds I bet it’s got the perfect crunch factor. I have many broccoli and many cucumber salad recipes but never once did I think to put them together. You make great salads. This salad is so perfect. I would love to eat this for dinner tonigh. Broccoli salad is one of my favorites, but I have never had it with cucumber in it. I will have to try this!